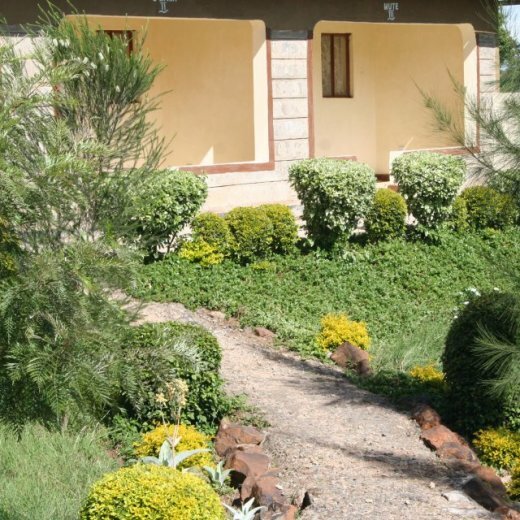 Built to take advantage of the rustic charm of a bed and breakfast but with all luxury modern convinces of newly built resort may have, the Savannah Garden Resort Bed and Breakfast is located 11km from the city centre along Magadi road. The resort is an ideal alternative to a night in a city hotel offering unraveled tranquility, serene environment where you can encounter various birds species from the expansive garden. Savannah Garden Resort is a scenic hideaway, a relaxing, tranquil and romantic retreat that is only minutes from Nairobi National park, Nairobi Safari walk and Animal orphanage. It is within easy access to shopping malls, Bomas of Kenya, Karen Blixen Giraffe Centre, Carnivore restaurant and right opposites Sheldrick Animal Orphanage. All rooms are comfortable and well equipped. Each bedroom has its own color and decorating scheme, ranging from the more feminine soothing violet to the more masculine colors. The furnishings and accent pieces are easy on the eyes. Savannah Garden resort offers English breakfast to give you a good start of the day. Dinner and lunch are provided on request. Meals can be taken either in private or with with our family.